Today, Wawa is your all day, everyday stop for fresh, built-to-order foods, beverages, coffee, surcharge-free ATMs and fuel services. A chain of more than 750 convenience retail stores (with over 500 offering gasoline), Wawa stores are located in Pennsylvania, New Jersey, Delaware, Maryland, Virginia and Central Florida. The stores offer a large fresh food service selection, including Wawa brands such as built-to-order hoagies, freshly brewed coffee, hot breakfast sandwiches, built-to-order specialty beverages, and an assortment of soups, salads, wraps, sides, and snacks. Wawa fuel services offer one price, whether you’re paying cash or credit, you don’t have to worry about the surcharge that most gas stations place on credit-paid fuel services. Wawa’s giving doesn’t just stop at fuel. Wawa also offers free-air and tire pressure checks at over 500 locations. Whether you’re fueling up for the road or stopping in for a built-to-order hoagie, your Wawa experience will have you leaving with a smile. Click here to find a Wawa location near you. Buy your Wawa gift cards from National Gift Card, the best place for you to order gift cards in bulk. National Gift Card is the leading expert in all things gift cards and we want to set up your gift card solutions program for you today. Please reach out to us for more details on direct-to-recipient or individual gift card fulfillment for your gift card program. Check out our contact page or call us at 888-472-8747 today! Treat this card like cash. This card may be used for fuel and eligible merchandise purchases. See stores for exclusions. This card may not be redeemed for internet purchases or cash, except where required by law. You may protect the balance on your Wawa Gift Card against loss, theft or damage by registering it at WawaRewards.com or through the Wawa App. Wawa will replace the remaining balance on a registered card at the time Wawa is notified of the loss. Check your balance on your receipt, on Wawa.com, through the Wawa App or by dialing 1-877-217-5366. Please have your card number ready. Card issued by Wild Goose Gift Card LLC. 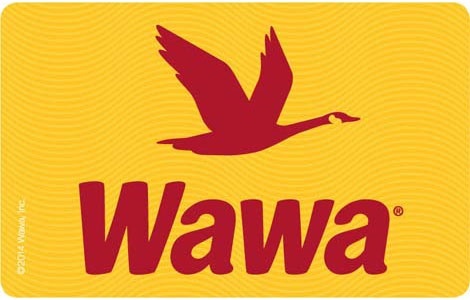 Wawa is a registered trademark of Wild Goose Holding Co., Inc.